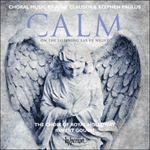 Stephen Paulus was The Dale Warland Singers’ first composer-in-residence and he composed Gabriel’s message as a Christmas present to Dale Warland’s wife Ruth in 2001. It is a simple arrangement of the well-known Basque carol for choir and harp, and like any good arrangement the secret to its success lies in the original material in the accompaniment. Most highly favoured lady’, Gloria! ‘My soul shall laud and magnify his holy Name’. Most highly favoured lady, Gloria! ‘Most highly favoured lady’, Gloria!